And yet, far from the Keane’s San Francisco, and perhaps as far as a person can get from Margaret’s frustrated acquiescence, we have Frida Kahlo creating a body of work that would eventually overshadow her husband’s, muralist Diego Rivera. Unlike Walter Keane, Rivera was a very good painter who did not attempt to overshadow his wife. Instead of professional jealousy, he had plenty of the personal variety. Even so, Rivera encouraged Kahlo's career and recognized her formidable talent, and she, in turn, supported him. 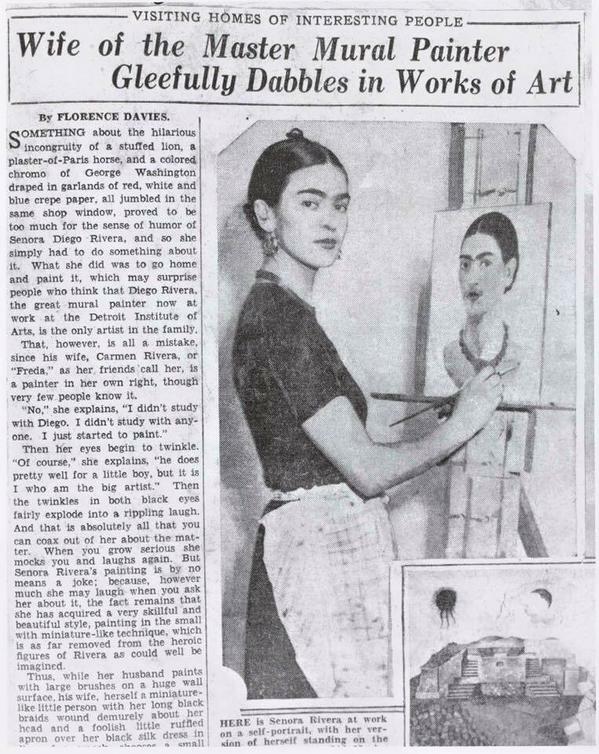 In 1933, when Florence Davies---whom Kahlo biographer Gerry Souter describes as “a local news hen”---caught up with her in Detroit, Kahlo “played the cheeky, but adoring wife” of Diego while he labored to finish his famous Detroit mural project. That may be so, but she did not do so at her own expense. Quite the contrary. Asked if Diego taught her to paint, she replies, “’No, I didn’t study with Diego. I didn’t study with anyone. I just started to paint.’” At which point, writes Davies, “her eyes begin to twinkle” as she goes on to say, “’Of course, he does pretty well for a little boy, but it is I who am the big artist.’” Davies praises Kahlo’s style as “skillful and beautiful” and the artist herself as “a miniature-like little person with her long black braids wound demurely about her head and a foolish little ruffled apron over her black silk dress.” And yet, despite Kahlo’s confidence and serious intent, represented by a prominent photo of her at serious work, Davies—or more likely her editor—decided to title the article, “Wife of the Master Mural Painter Gleefully Dabbles in Works of Art,” a move that reminds me of Walter Keane's patronizing attitude. The belittling headline is quaint and disheartening, speaking to us, like the unearthed 1938 letter from Disney to an aspiring female animator, of the cruelty of casual sexism. Davies apparently filed another article on Rivera the year prior. This time the headline doesn’t mention Frida, though her fierce unflinching gaze, not Rivera’s wrestler’s mug, again adorns the spread. 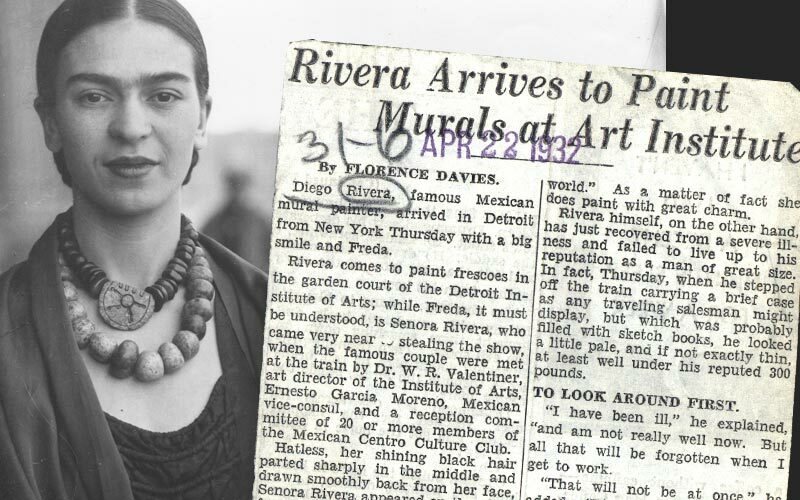 One sentence in the article says it all: “Freda [sic], it must be understood, is Senora Rivera, who came very near to stealing the show.” Davies then goes on to again describe Kahlo’s appearance, noting of her work only that “she does paint with great charm.” Six years later, Kahlo would indeed steal the show at her first and only solo show in the United States, then again in Paris, where surrealist maestro Andre Breton championed her work and the Louvre bought a painting, its first by a twentieth-century Mexican artist. And Margaret Keane? She eventually sued Walter and now reaps her own rewards. You can buy one of her paintings here. Frida Kahlo, the housewife? I visited their home years ago, and was told by the tour-guide that it wasn’t her art that she took pride in the most…but her fantastic cooking skills! A historical perspective is important… We could look at the situation and say how bad it was that females had their husbands go to work for them, working in dangerous or mind numbingly boring jobs.. and when they came home they couldn’t just relax they had fixed the broken railing, cut the lawn, fix the car, etc. Clearly the social structures of the past had good and bad aspects… and some disproportionally effected females.. (and others males). Peoples interests did not always conform to the generally accepted practices.. males and females did all kinds of things as they still do. The context of the piece is “Visiting Homes of Interesting People” Frida did not go to the USA to exhibit her work. If she was not married to the “Famous Mural Painter” she probably would have got no mention in the media at all. She was not know for her work.. she was however very much known as a very famous painters wife. If she was famous artist or had an established career, then the word “dabbled” would not have been used. The article by Florence Davies is a short piece. Did Florence know anything about art?.. did she care about art? The article is written more on the subject of people than art. Still she states..
Two paintings are pictured in the story clearly acknowledging her painting. So does the title depict the impression Frida presented or a patronising dig at women? Commenting on Frida’s clothes and look is commenting on her art. Her art is her life. But still people have commented that this was typical and belittling. But in the other piece by Florence we read about Diago’s dress and appearance. But people dont mention that.. Why? When Frida had her solo show she showed in a gallery that exhibited Duchamp, Giacometti, Tanning, Ernst, Magritte, Kahlo, Ray, Cornell, and Arshile Gorky. Clearly by that stage she did not consider herself a “dabbler” any more. The show went from November 1-15, 1938, at the avant-garde Julien Levy Gallery in New York City. So did female artists suddenly gain some acceptance or was it that female artists were respected? There are all kinds of assumptions about all kinds of things. Many people dabble with art it is a very common description. It is not a negative connotation or belittling. The other description is “Sunday Painter”. These do not mean that the person was not fully engaging with what they were doing at the time. It simply implies that it was not their profession or that art was not literally their career. I know of someone who visited Frida’s house, who was told by the tour-guide that it wasn’t her art that she took pride in the most…it was her fantastic cooking skills. Society was not as backwards as you may think at the time. Female artists, performers, philosophers, musicians, athletes, explorers, aviators were quite known and visible.. not as many as males doing the same but still there. I just think that people (in web land) have taken this article out of context and overlooked the historic gem that it is and the historical facts about her life at that particular time, in favor of portraying it as some signifier of social injustice… as if she was this famous renowned painter that was consciously belittled as such because she was female.